I WAS GEARING UP to be extremely critical of Donovan McNabb Sunday, as the second-half three-and-out series piled up and a blowout win teetered on the brink of becoming a bizarre loss. McNabb, after displaying perfect vision and touch the first half, suddenly started spraying the ball all over the Lincoln Financial Field turf. After adroitly mixing and matching Brent Celek, DeSean Jackson, Jeremy Maclin, Jason Avant and his other weapons, McNabb seemed to only see Jackson when the game tightened, Jackson working against one of the all-time greats, Champ Bailey. Obviously, the confused offensive line, after Jamaal Jackson went down and the Broncos started bringing more pressure, didn't help. The run game disappeared. Then, on third-and-25 from his 15, receivers covered, under 5 minutes left and the score tied, McNabb took off. It looked crazy. 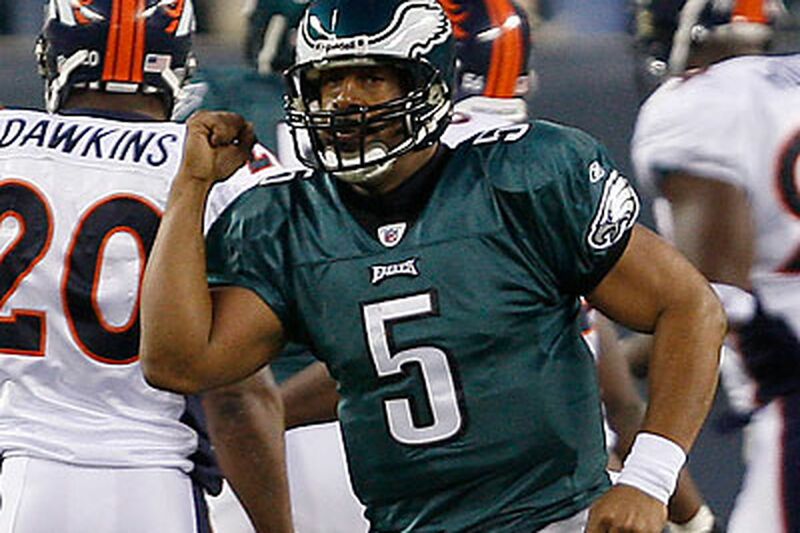 This was the 2009 McNabb, battle-scarred 33-year-old father of four, not the kid from Syracuse whose feet were more reliable than his arm. But on he scooted, 27 yards, to a point just in front of the sticks on the Eagles' sideline, and the Birds had a first down after going three-and-out four times in a row. "All that I focused on was the yard marker," McNabb said. "When I got out [of the pocket], I knew somebody was behind me, but I got the knees up and tried to get as much as I could." The Eagles ended up punting on fourth-and-1 from Denver's 49, but as Andy Reid noted afterward, they'd finally switched around the field position. And when their defense held, and Jeremy Maclin cradled that huge 27-yard catch, the Eagles were set up to win. McNabb wasn't doing this kind of thing for a few years there, most notably in the doldrums of 2008, when he ended up getting benched briefly. Any quarterback can go cold, any offense can have four bad series. This time - and really, several times this season - McNabb pulled himself and the team back together. That run showed both great confidence and determination. A fragile guy who can't handle pressure doesn't take off on third-and-25 and gain 27 yards. A fragile guy who can't handle pressure doesn't hit Maclin - it was a really good, back-shoulder throw, against solid coverage from Andre Goodman - with the game on the line. Yes, McNabb could have been a lot more consistent, could have sensed pressure a little better on a few of those sacks. These days, though, you get the feeling that even when he's down, he isn't out. * Normally, I'm more critical when a team blows a big lead as the Eagles did Sunday, but I really felt the Broncos benefited from "Deus Ex Macho." The whole ball of string unraveled because of one guy. And the penalty that started the unraveling, I really think was lame. Yeah, the NFL is emphasizing the "defenseless receiver" bit this season. But after a ball has been intercepted? Really? After watching a bunch of replays yesterday, I liked the call even less. Tony Scheffler was not defenseless; he'd come down and was looking right at Macho Harris. Can't blame the defense much at all for what happened. * One more Macho caveat. On the awful kickoff return fumble that led to the last Denver touchdown, I first thought he just didn't see Darrell Reid about to unload on him, but on replay, Harris tries to cut back and his left ankle buckles, on the crumbly Linc surface, leaving him leaning into the hit. Should have protected the ball better, but also a bad break. * I think as good as Jamaal Jackson is, Nick Cole is a decent replacement, maybe more suited to center than guard, once he scrapes off the rust. The real problem now is at right guard, where Max Jean-Gilles is very limited and very inconsistent. It's been a year since Stacy Andrews tore the ACL in his right knee. Time for him to play, and play well. * Somebody e-mailed me yesterday noting that Danny Amendola is a decent kick returner, and the Eagles could be using Amendola, had they not consigned him to the practice squad at the end of training camp, from which he was plucked by the Rams and Steve Spagnuolo. Reasonable observation. But everybody knows, the Birds broke camp with too many wideouts. Their kickoff returner the first half of the season was Ellis Hobbs, one of the league's best the past three seasons. When they parted with Amendola, the Eagles didn't know Hobbs would suffer a season-ending neck injury, or that last season's solid kickoff returner, Quintin Demps, would keep reinjuring an ankle. So, yeah, you can criticize them for not keeping around a really good third kick-return option, if you want. The Eagles' 24 interceptions represents their highest total since 1999, when they had 28. That Jabar Gaffney would be the former Eagle with the biggest impact (two touchdown catches) on Sunday's game, with Brian Dawkins and Correll Buckhalter returning to the Linc? Heard the Comcast SportsNet postgame panel puzzling over why inconsistent punter Sav Rocca hasn't yet been given the boot. Two words: David Akers. The Eagles' persnickety kicker is having a Pro Bowl-caliber year, which might actually become a Pro Bowl year when the rosters are announced this evening. Rocca is his holder. Akers is very invested in the placekicking process, and does not embrace change. Sav might have been out of here weeks ago if he didn't have that crucial role in the field-goal operation; Akers leads the NFL in scoring this season and is 32-for-36 on field goals. That's the fewest misses Akers has had since 2002, when he finished 30-for-34. Rocca's 28-yard shank in the fourth quarter Sunday was the last thing a scrappy Eagles defense needed, as it kept trotting out to defend the Broncos on half a field. Rocca set up the third straight fourth-quarter Denver possession that began within 6 yards of midfield, and when the Eagles finally surrendered a first down, Matt Prater boomed a 46-yard field goal that tied the score. True, Rocca subsequently lofted a 40-yarder fair-caught at the Denver 9, leading to the winning sequence, but over the years here, up-and-down punting has not been long tolerated. Rocca's 37.9-yard net, which matches the franchise record he set last season, has considerably more to do with Ted Daisher's coverage team than with Rocca's consistency. I think Akers might spend the offseason breaking in a new holder. It isn't happening on the verge of the playoffs, though.